The decision to procure or to subscribe to a new ITSM tool invariably involves a significant investment. Such a purchasing decision should be treated like any other significant business investment, yet experience suggests that with regards to ITSM Tool selection the normal rules of procurement good practice are often not heeded. Research shows that organisations typically replace their ITSM tools every 3-5 years. This is arguably because organisations suffer a lack of ITSM improvement road maps, which baseline the current state and outline the people, processes and technology resources required to reach the desired state. The challenge is compounded as the ITSM tools market is increasing crowded, complex and dynamic. In short ITSM tool selection is a complex decision! 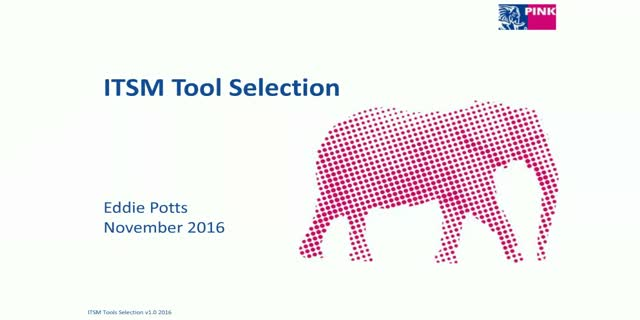 Join Eddie Potts, Principal Consultant of Pink Elephant EMEA, as he highlights best practice methods of choosing an ITSM tool as an introduction to the ITSM Tooling Whitepaper being released in mid-November 2016.